The High Rise™ Mobile Adjustable Standing Desk gives you the ergonomic benefits of a sit to stand desk plus the mobility of a cart. Wherever you need to go, your desk can follow. Rising to 44” and lowering to 29”, the standard sitting height, the DC500 Mobile Sit-Stand Desk is the perfect ergonomic solution to your adjustable desk needs. The large work surface can accommodate a computer, keyboard and desktop necessities such as files, notes, calculator, or phone. 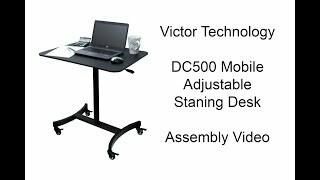 This multi-functional table can be used in multiple settings, including office, classroom, production set, crafting, workshop, warehouse, flea market, lectern, healthcare, and any other application where mobility and variable height adjustment helps get the job done. 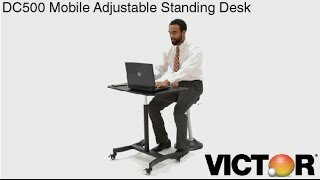 Sit or stand with the adjustable desk height of 29" to 44"